Actually it’s brighter than you might think, even three and a half billion miles from the Sun. And with the New Horizons spacecraft closing in on the first-ever pass by Pluto in July, NASA has a way for you to get an idea of the type of lighting you would experience on the surface of Pluto… and a way for you to share it with the world. Then you can take a picture from your location and share it on Facebook, Twitter, Instagram, Flickr, or YouTube with the hashtag #PlutoTime, and NASA will compile all of the images and create a montage using those along with some of New Horizons’ best views of Pluto and its moons, similar to what was done with Cassini’s picture of the Earth from Saturn in 2013. 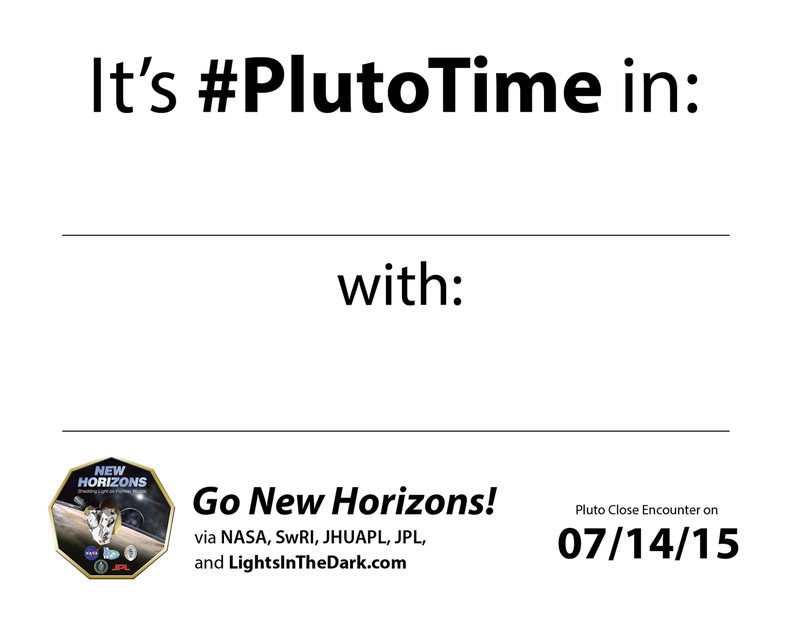 Click and print this page for your #PlutoTime photo! Fits best on 8.5 x 11 landscape orientation. The time is usually just after sunset in your location – given a clear day it’s not all that dark, is it? You can easily see things around you without additional lighting and probably even read a book. New Horizons has been traveling through space for over nine years, and now it is in the last few steps of its final leg to reach the Pluto system – in fact it’s now sending back the most detailed images ever captured of Pluto! Everything from now on will be a superlative with the mission – click here to see what principal investigator Dr. Alan Stern had to say about it all during an interview I held with him in March. Follow the latest news from the New Horizons mission here, and find out where the spacecraft (and Pluto) is here. New Horizons is an amazing mission – never before have we been to Pluto, and it’s currently a tad further away than Neptune, so it’s also the furthest planet we’ve ever sent a probe too. How cool is that? Hopefully it’ll collect some awesome science as it whips through the Pluto system. This is very exciting. Looking forward to the reality! I love this blog and today’s post is fantastic. I look forward to seeing photos moved closer to Pluto !! This is so exciting (and so is the Dawn mission to Ceres). I was surprised to learn that 9:00 PM central time is Pluto time in the Minneapolis-St. Paul area. I wondered if the photos got a boost from camera sensitivity, but 9:00 PM is pretty bright around here at this time of year.